Bridge of Spies is the latest film from Steven Spielberg with a screenplay co-written by the Coen Brothers and stars Tom Hanks. I remember reading that headline a year ago and thinking that this would be the coolest film. Spielberg is following up his Oscar-winning Lincoln with a true story about Cold War paranoia in 1950s America. The film has a prime release date in October, so no matter the quality of the film, there will be talk of Oscar for this film. Are Spielberg and company able to pull this one off? Here’s the review. Tom Hanks plays James Donovan, a real-life insurance lawyer in 1957 New York, whose been assigned a case involving a possible Russian spy, played by Mark Rylance. Donovan takes the case, knowing that people will hate him for doing so. As Hanks is in the middle of his case, he’s approached by the government to be apart of a possible exchange in East Berlin. A U-2 (sorry about that) spy plane and its pilot are both taken down in East Berlin, and is detained by the government. Donovan also tries to fight for the release of an American college student whose also been detained in East Berlin. The Coen’s share screenwriting credits with Matt Charman, a relatively unknown writer whose only other film credit to his name was Suite Française, a little known WWII film. Spielberg continues his more recent trend of telling dramas that are based on historic events, and most of them have been to wide acclaim. His only sore thumb releases in the past 15 years have been his War of the Worlds remake, A.I. (which many either say is brilliant or terrible), and of course, Crystal Skull. Coincidentally, I kept thinking of the lackluster fourth Indiana Jones film watching this film, because Spielberg really nailed the 50s Cold War paranoia that was going on at the time. You don’t really feel angry at the people who are angry at Hanks’ character for taking this case on, since everybody in America thought that the Soviets were going to kill us all. With that touch of sentimentality/schmaltz thanks to Spielberg’s direction, Janusz Kaminski’s cinematography, and Michael Kahn’s editing, all of Spielberg’s trademarks are here, and they work beautifully. I didn’t mention John Williams in the names of Spielberg’s longtime collaborators because, for what feels like maybe the first time in a long time, Williams did not provide the score for a Steven Spielberg film. Williams was appropriately busy with the score for the upcoming Star Wars film, so Spielberg got the next best thing in Thomas Newman, and we get to hear some of Newman’s trademarks in his score, with some nods to what you would typically hear with John Williams. All of this help elevate Bridge of Spies to be yet another great historical drama from Spielberg. The film, similar to Lincoln, is a very dialogue-heavy film, which I really enjoyed, but I could understand if folks get turned off by that. 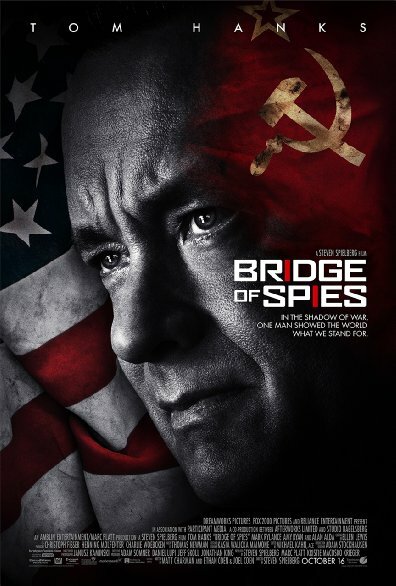 The film is 2 hours and 20 minutes, which could be a bit straining on the average movie-goer, but thanks to the great direction, Hanks’ performance, and so on, make Bridge of Spies end up being one of the better films of 2015. Hanks rarely ever gives a bad performance, and he’s great here as the charismatic and good-natured Donovan, whose a family man first and a lawyer second. Mark Rylance is quite good as the accused Soviet spy, and for those who enjoyed the character actor’s work in this film will be pleasantly surprised to learn that he’ll be playing the BFG in Spielberg’s adaptation of the Roald Dahl children’s novel next summer. Amy Ryan is good in brief supporting role as Donovan’s wife, and Jesse Plemons, who seems to be everywhere nowadays, has a brief role as a soldier. It also helps that the rest of the supporting cast, along with everybody mentioned above, is as great as they are, since the film is a very talky film that’s a bit of a slow-burner, because the characters/actors make the situations feel all the more compelling and intense. Like most of Spielberg’s films, there are moments that feel a bit silly that are meant to make the audience laugh in a story that’s far from funny, but sometimes it didn’t quite hit. Other than that little nitpick, Bridge of Spies is a solid historical drama, and if you’re a fan of Hanks, dramas, Oscar-contenders, or Spielberg, this should be a must-see this fall for you. I can’t say that the film will be the juggernaut that Lincoln was when nominations are called in January, but I would be shocked if the film was omitted from the Best Original Screenplay categories, and others.